T S Paul: Get the first three books in the Athena Lee Universe for $0.99! 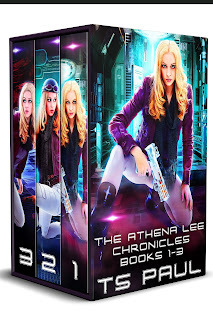 Get the first three books in the Athena Lee Universe for $0.99! Athena Lee had everything going for her. She graduated the Space academy and had become an Engineer. Her first posting was to an Support fleet building a secret outpost. When her ship is attacked and destroyed she is left alone and forgotten. Athena has to engineer her way home. Rescued many years later. She is arrested for letting an Idiot kill himself by not following orders. Now she has a bounty on her head and is being chased by assassins. Joining a navy not her own she fights for truth while surrounded by corruption and greed. Pirates and bounty hunters bar her way.